Online censorship is the latest battleground in the fight for freedom of information, and every country is handling it differently. The Czech Republic has the twenty-third lowest rate of Internet censorship out of a ranking of 179 countries, according to new data released by global monitoring agency vpnMentor. The countries with the most limited access to information are North Korea an Iran. The Czech Republic, like most European countries, has a relatively low rate of Internet restrictions, particularly when it comes to access to the BitTorrent network, which is used to download files. Freedom of speech is disrupted only by denying the communist past and the Holocaust and in the case of hate speech. 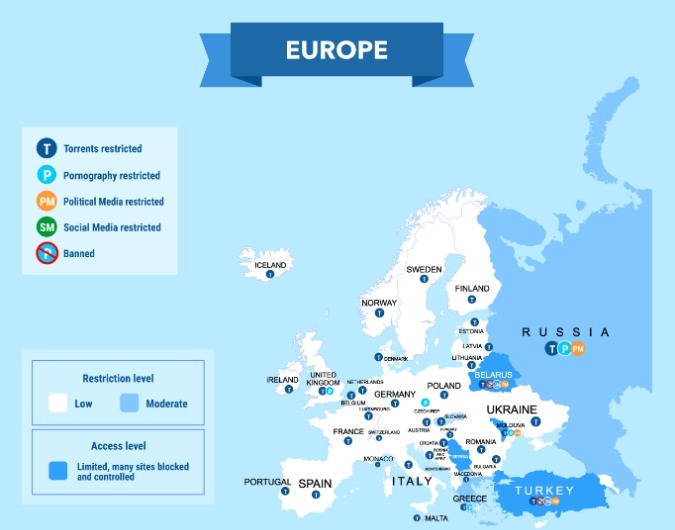 See the infographic map above to see complete restrictions by country, and where Czechia ranks in the world of online censorship or see complete global rankings here.